The CAMI Client is a Java application, which requires Java 8 to be installed on the client machine. It can be downloaded from https://data.cami-challenge.org/camiClient.jar. 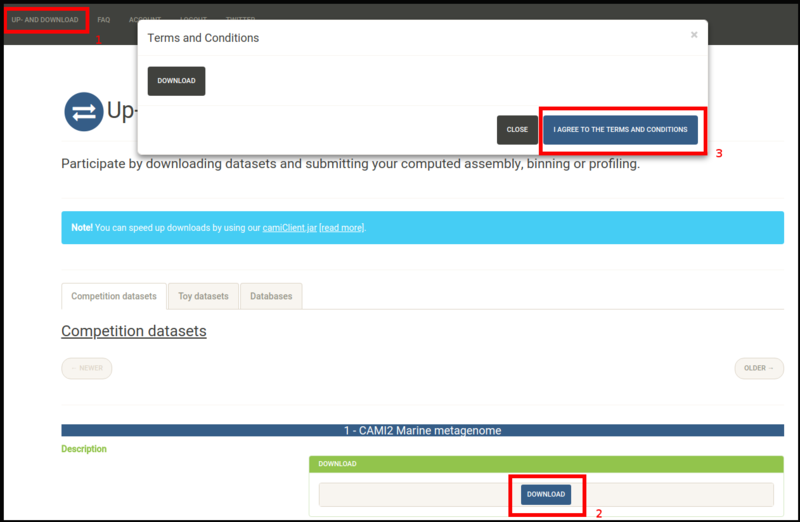 The CAMI client works by using reading the contents of a small linkfile - which is first downloaded locally from https://data.cami-challenge.org - and then using this to download the actual data files themselves. The linkfile contains time-encoded links specific to each download and can be found under the desired download. Run the CAMI client, giving the -d argument and referencing the locally-downloaded linkfile and a target location for the data files (this location will be created if necessary). Note that if the linkfile has a space in the name, it will need to be wrapped in quotes.